San Diego Surf Mamas - She Loves Surf! 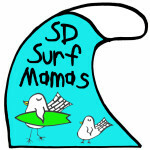 San Diego Surf Mamas - She Loves Surf! Surf moms in the news! Check out our zazzle.com site for Surf Mamas threads!